Drifter 2.0 retains the magic ingredients we love and continues to excel in those mushy waves and smaller conditions nearly all of us ride nearly all of the time. Sure, we’d all like to kite peeling perfection in strong winds but let’s be real, that doesn’t happen very often. 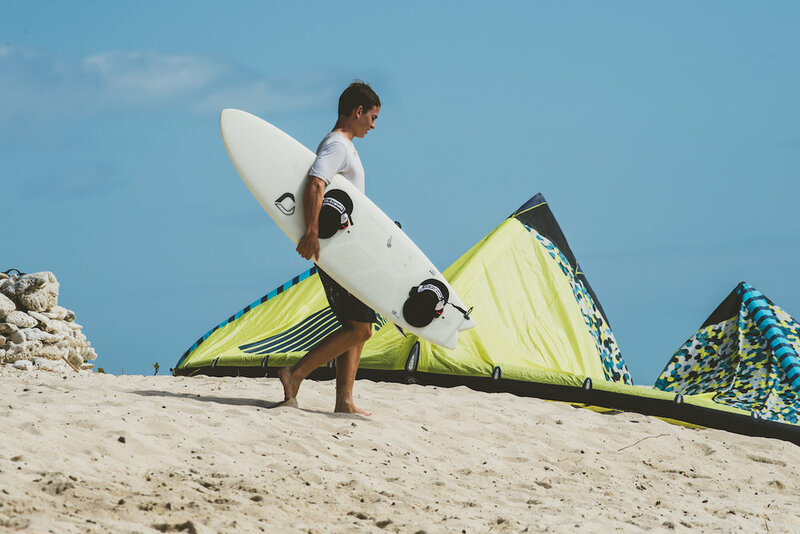 We need something that makes going upwind a breeze, a board that can handle heavy landings and loves to slide out and make sloshy conditions fun. With its flat rocker and wide nose, the Drifter 2.0 will get you in the water more and keep you there longer. The manufacturing of the board is in Europe with Apple Tree Company, where a unique technology was developed to ensure the lightest and yet strongest board available on the market today. The Drifter was originally designed as surf & kiteboard but with the latest innovations on both shape and construction the board has tremendous qualities for kiting, not only shape wise, but also offering you a bullet proof construction that withstands the fierce pressures during riding on the board and thus making the Drifter 2.0 more durable. Although this board is designed for kite-only, it’s a traditional surfboard shape so we recommend to ride it one size down from your regular surfboard. XPS is like EPS so it only works with epoxy resin. But it is different that it does not contain the beads that EPS has, That’s whey call it closed foam, it means it’s completely waterproof! So no worries when you ding the board. just keep kiting and fix it later. XPS is notoriously hard to laminate, but our fusion tech makes it possible! The core is fused with the skin, this gives an optimal bond between skin and core, virtually eliminating de-lamination. The Drifter 2.0 comes with a thruster (three fin) setup in your choice of FCSII or Futures. The Drifter 2.0 comes standard with foot strap inserts. This shape is tried and tested and has been a part of our board lineup for years. This season we have added the FCSII and Futures fin system as per personal preference and are manufacturing at Apple Tree, a factory renowned for innovative board building, quality and sustainability. It has closed foam XPS which is like EPS so it only works with epoxy resin. But it is different that it does not contain the beads that EPS has, that’s whey call it closed foam, it means it’s completely waterproof! So no worries when you ding the board. just keep kiting and fix it later. XPS is notoriously hard to laminate, but our fusion tech makes it possible! The core is fused with the skin, this gives an optimal bond between skin and core, virtually eliminating de-lamination. Strategically placed patches provide a durable platform for your feet. These patches are made from a super high strength PET honeycomb foam that is radically different from any other honeycomb on the market today. The honeycomb is set into the deck of the board, it doesn’t just sit on top of the foam. The patches are sandwiched between fiberglass layers, together they form a very dent resistant layer and prevent the deck under your feet from denting marks. The boards are glassed in clear epoxy so you can look directly inside the board, we have nothing to hide under layers of paint! The color on the boards come from tint in the resin itself, it’s transparent and will never fade.